Not so long ago wire EDM was considered nearly useless for injection mold making; my how things have changed. These days, WEDM’s run around the clock, machining all kinds of mold components. Most shops have several of these amazing workhorses, usually with only one operator running all of them. Talk about unattended machining, this is the prime example. It is commonplace for the WEDM to run for days on end, all unattended and highly accurate. 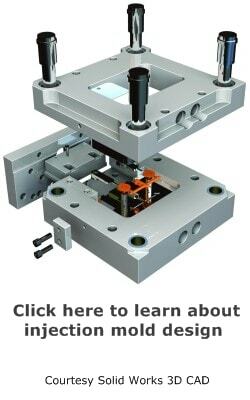 It is understandable why mold makers considered them to be only useful for die-making and other applications; after all, dies have through holes and molds have “blind” cavities. What good is a fancy bandsaw going to do with a cavity block anyway? The only limits with Wire EDM are self-imposed. What used to appear impossible is now routinely accomplished. You just have to be creative. Not bad, for a machine once thought of as useless for mold making! 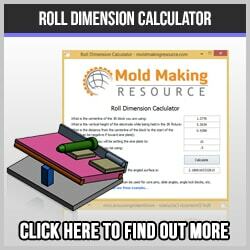 From a mold makers viewpoint, WEDM is priceless as a tool. The labor savings from grinding complex core pins, highly detailed inserts with compound angles, and contoured parting lines is truly significant; not to mention the stress and headaches! With a little creativity, many electrodes can be cut on the wire EDM. Generally, copper cuts much faster than graphite, and has the advantage of finer finishes and ability to EDM fine details. Premium grade graphite can be used, but is slower to cut. It is amazing how a creative injection mold design can use the wire EDM to make electrodes, inserts, cores and many other things. The labor savings can be tremendous, both in electrode manufacturing, fitting, grinding and polishing. Many inserts can be WEDM’d, then EDM’d in the sinker EDM. This marriage of technologies is one of the best examples of ingenuity using Wire EDM. Only minor grinding is required after EDMing to remove the tabs left from WEDM. Many of the tedious grinding operations of the past are now a distant memory, not many people miss them either! If you can imagine it, you can most likely build it. Necessity is the mother of invention and competition seems to spur the need on. The pockets that are home to the inserts which were wired, now fit precisely. Nearly all of the pockets that are in difficult to reach locations are now routinely WEDM’d. The hassles of tapered sidewalls, fitting corners, as well as size and location are also now a thing of the past. complex geometric shapes that are impossible to even define are routinely done in the wire EDM, with their mating parts fitting perfectly (most of the time!). Complex geometry that was previously milled or ground can be machined more accurately and quickly on a WEDM. Angles, sizes and complex radii are all commonly machined on using wire. 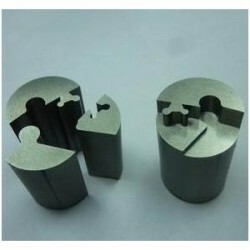 The pockets that hold cores and cavities, plus the holes and pockets that hold interlocks and other details can accurately be cut on a wire machine. An added benefit is that the slug from the pocket is no longer a pile of oily chips! It can be used for other components. An additional savings is in end mills and machine time, since most WEDM is unattended. Usually starter holes are drilled in the cores during CNC machining. Later, after heat-treat, the details are hand polished. Then the holes can be finished in the WEDM. This has many advantages: no bell-mouthing of holes, easier polishing, more accurate hole location and size, and better surface finish. Tiny vents can even be incorporated in the holes! Many shut-off surfaces and molding surfaces can be finish milled, but others lend themselves to wiring. This greatly increases the accuracy of the complex shapes. Of all the operations to produce a high quality injection mold, polishing is the most vexing. There is often just no way around the fact that a highly skilled mold maker must polish the mold, at great expense. This often causes a bottleneck in the scheduling and delivery. Using WEDM where applicable greatly helps to reduce the time spent polishing. All in all, wire EDM has had a dramatic and very positive impact on moldmaking. It is hard to imagine a modern shop without a WEDM, or access to a custom wire shop. 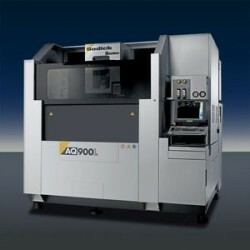 Accuracy, speed, superior fit and finish are all the direct result of wire EDM. I, for one, sure don’t want to go back to grinding those complex inserts with compound angles, blended radii and all those fussy shut-offs!